Once the camper was ready to go I switched directions and turned my focus to my Jeep. The Jeep Cheerokee is a good all around utilitarian vehicle, but it is by no means an ideal choice for pulling a 4,000 pound camper full of motorcycles around the continent. There were a few pressing issues that needed to be addressed. Jeeps are notorious for weak suspended rear ends. They sag over time and mine was particularly sagged low due to me being a bit brutish to it over the years. After weighing options about buying different rear spring packs or scrounging used parts I ended up taking my measuring tape down to the junk yard. Mixing and matching Chevy S-10 leaf packs is a common way for off-roaders to lift their rear end a few inches. I measured up packs from a number of different vehicles and ended up snagging some from a GMC truck (blanking on the model). DSC03306, originally uploaded by evanfell. 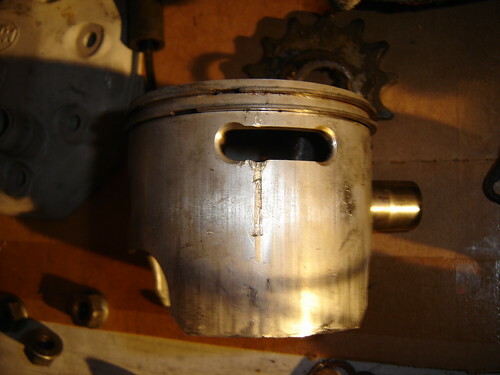 This is the piston from the 1988 KTM 500mx I picked up (see the previous post). You can see the giant gouge that was created as coolant flooded into the cylinder from the blown head gasket. When metal changes temperatures that quickly there’s really no predicting how severe the damage is going to be. The cylinder has a matching scare on it but is otherwise in good condition. Unfortunately these pistons are a bit hard to come by these days. Some custom piston houses do limited runs from time to time. There are also a few remaining NOS pistons on dealer shelves and the guys over at KTMTalk.com bump into them from time to time while fishing through bins like old vinyl. My posts on that ADV thread below kind of died out. It turns out that moving into a camper and preparing to travel the world is a very time intensive endeavor. The time I had available to write about the launch was minimal. So here is the rundown . . . . 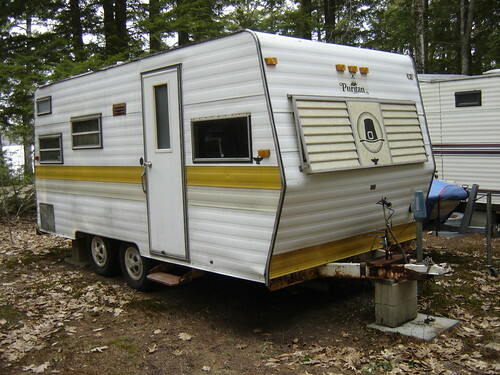 The camper I ultimately ended up with is a 1980 Puritan 16 foot dual axle model. The picture below is the location I got it from in exchange for a days worth of yard work. 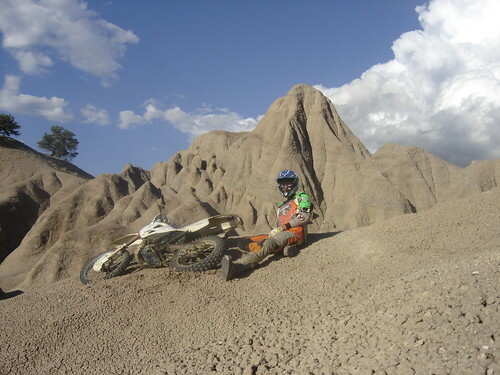 Eight months ago I broke my silence on the ADVRider Forums about my preparations for a trip. Below is a copy/paste of some of my posts starting 1-18-2008. Here is a link to the thread. I have spent way too much time reading this site over the years and not enough time participating. Here is where it starts. First a quick introduction. My name is Evan, I live just North or Boston, MA USA. I’m 25, I rent, and I work from home as a freelance web developer. Here’s a not-so-close-up photo. Thick Natural Sand, originally uploaded by evanfell. 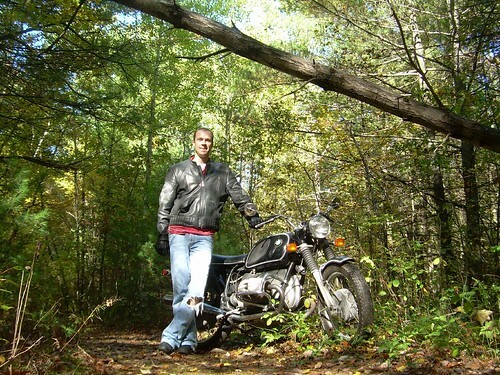 Iâ€™ve been out riding off-road a lot lately. This week Iâ€™ve been riding up over 8,000 feet and wow is it exhausting. The terrain is rough and the oxygen content is low. 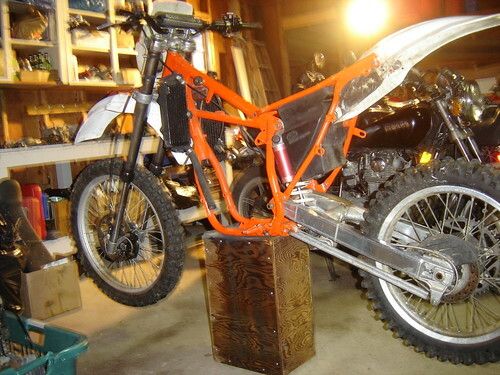 If you want to ride up this high and have a carbureted bike youâ€™ll need to rejet. Some bike are more picky about oxygen levels than others, but for my KTM I had to drop 2 sizes on the main jet, 1 size on the pilot jet, and I lowered the needle 1 clip. Iâ€™ll put together a good guide for altitude jetting across different motor types shortly. This site needed a facelift badly. It’s now much nicer. Back to business as usual.